When an attendee requests to be unsubscribed, his subscription state is updated automatically. 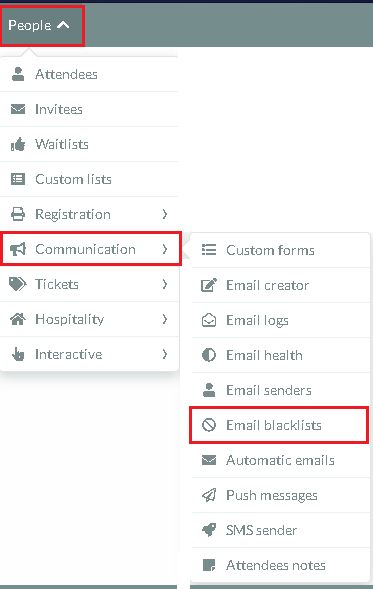 Manage e-mail blacklists acts as a filter preventing certain e-mail addresses from receiving emails, as they requested. At the time you send a message to a given list, our AI intelligence checks if the attendee’s address is included in the blacklist: if it is, that mail will be ignored and they won't receive the message. When the attendees want to unsubscribe, they will press this link on their email. You can export the email blacklist to an excel sheet. Then in the top left corner press the 'REPORT' button. A message will appear along the top of the screen with a download button, Press download and your email blacklist will be downloaded as an excel sheet.